It's like Android Auto, except cheaper and easier to set up. Plugging your phone into your car has become second nature for most drivers. After all, at this point your handset probably has more functionality than your vehicle. Plus, while your car's infotainment system might see an upgrade every three to five years, smartphones are constantly being updated with new features and better apps. Unfortunately, tapping at tiny onscreen buttons while flying down the road at 60 miles per hour isn't exactly safe. The desire for better in-car tech without compromising safety is what led Drivemode co-founders Yo Koga and HK Ueda to create their auto-centric Android app. 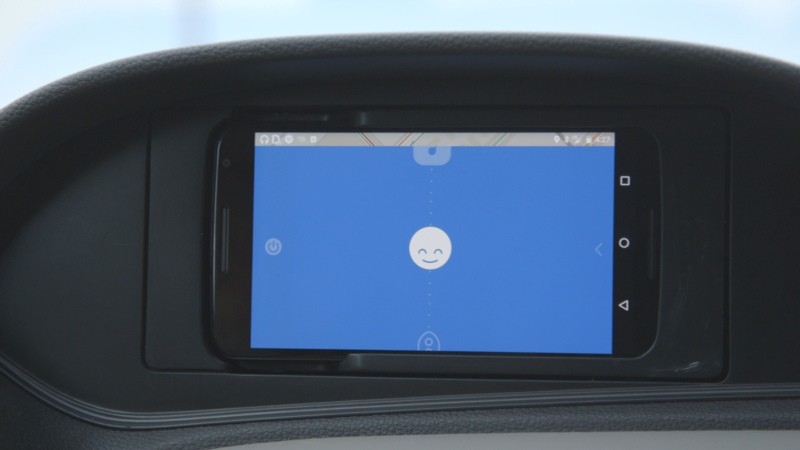 It presents a clutter-free UI specifically meant for driving. The single-button, no-look interface uses display-wide swipes and taps and presents audio cues to help keep your eyes on the road -- and not the glowing rectangle you have mounted to your dash. With over 400,000 downloads, the app has gotten the attention of not just drivers, but also major automakers, including Honda. The carmaker has partnered with Drivemode to create a concept vehicle that completely replaces the head unit with a phone. It's not just shoving an Android device into the dash either; the head unit is completely integrated with the car's controls. For instance, the buttons on the wheel that usually control the radio now control the app. Additionally, the backup and right-side blindspot cameras are now displayed on the phone too. Honda and Drivemode say this is still just a concept and potentially years away from actually happening. But it's part of a larger plan to build an app for automakers; a way to offer its software replacement for the traditional in-dash system. In the meantime, though, Drivemode is looking for other ways to make a bit safer. For instance, Ueda says the app will eventually support aftermarket Bluetooth backup and blindspot cameras. So, drivers can buy the cameras and mount them to their cars, allowing them to have an additional safety feature, even if their vehicle didn't have that option when purchased new. In particular, the Drivemode team sees an opportunity in lower-end vehicles that are less likely to come pre-installed with Android Auto or Apple CarPlay. The app replicates many of the features found in those systems which tend to be found in medium to high-end cars. For drivers who can't afford the trim levels that offer those smartphone-integrating options (or are are not looking to upgrade their whip), they can still enjoy a more integrated driving experience without weaving all over the road trying to launch Spotify. Unfortunately, the app is for Android only right now, but Drivemode is looking for additional funding to build an iOS version.